Made of fireproof and self-extinguising material. 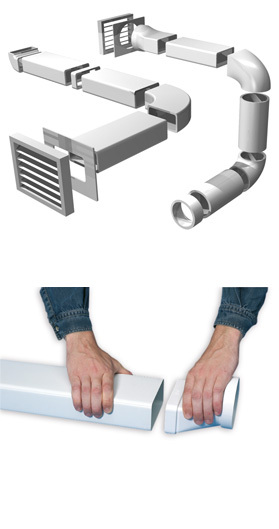 Smooth internal wall ducts to reduce pressure loss. Better performance in Ventilation, Aerothermy and Extraction than the flexible. Suitable to any structure due to its low profile. Specially in false ceilings. Adaptable to any type of building, even residential and tertiary. SIMPLE FASTENING OF THE SYSTEM. Thanks to the foldable ducts Tubpla® Plus. Less space to stock and transport. Recommended installation for humidity sensitive and heat recovery ventilation systems. Without risk of deterioration by moisture unlike the classical flexible ducts.